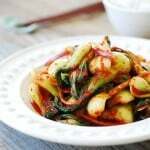 Last month, I introduced a salad-like kimchi called geotjeori (겉절이) using baby bok choy. 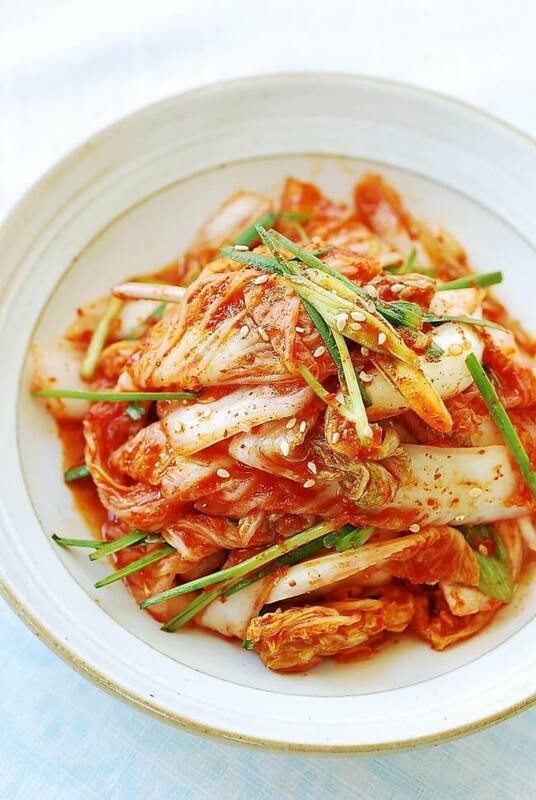 Geotjeori is basically a kimchi that’s made to be eaten fresh without fermentation. As such, the vegetables are lightly salted. 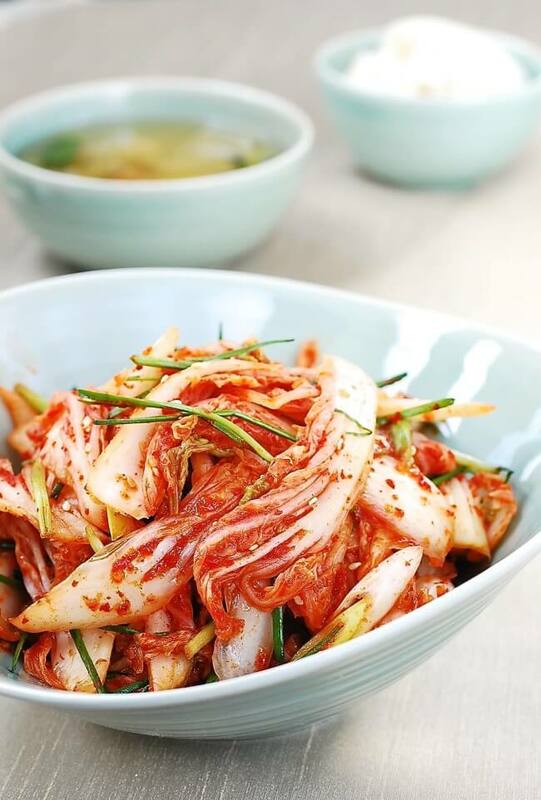 Fresh kimchi goes especially well with dishes such as kalguksu (warm noodle soup) and Korean BBQ meat. 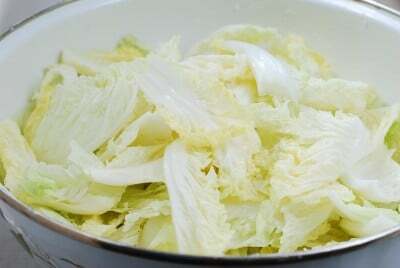 Geotjeori is most commonly made with napa cabbage, baechu (배추). Summer napa cabbages tend to be small with thinner leaves, and it’s perfect for making baechu geotjeori. 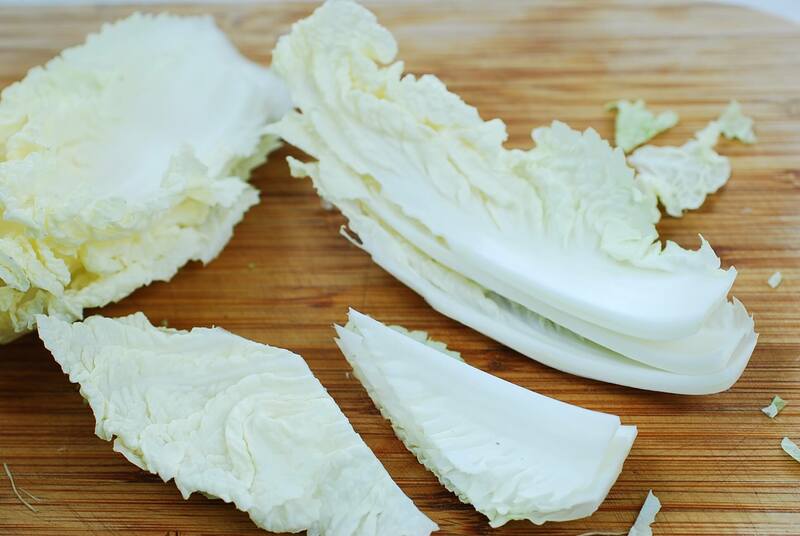 If you have a large cabbage, only use the inner tender parts. You can save tough outer leaves for baechu doenjang guk later. 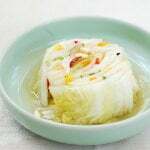 Because it’s eaten without fermentation, during which a natural sweetness develops, the addition of sugar or corn syrup (or Korean rice syrup) helps round out the flavor of geotjeori. 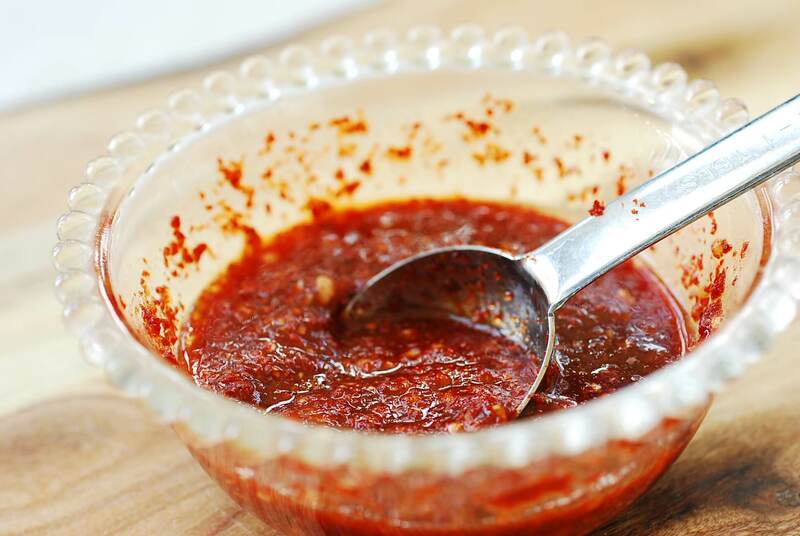 In this recipe, I also used Korean plum syrup called maesil chung (매실청). You can simply omit it if you don’t have it, but it adds a natural fruity sweetness to the dish. 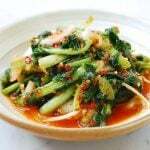 Maesil chung is not an ingredient that I grew up with, but it has recently become a popular ingredient. I also added minari (water dropwort) and buchu (garlic chives) to this recipe for extra flavors. They are in season and available in Korean markets in my area. You can omit them if you can’t find them. Separate the cabbage leaves. Cut each leaf lengthwise, and then cut crosswise once or twice into long bite sizes. Rinse in water and drain. 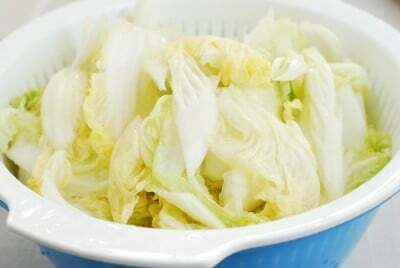 Place a layer of cabbage in a large bowl and sprinkle with a tablespoon of salt. Repeat with the remaining cabbage and salt. Toss well to coat evenly. Leave it for 40 to 60 minutes until softened, tossing once halfway through. Roughly chop the scallions. Cut the optional minari and buchu into about 2-inch lengths. Combine all the seasoning ingredients in a small bowl, and mix well with 2 tablespoons of water. Rinse the cabbage twice and drain well. Add the seasoning mix to the cabbage. Using a kitchen glove, toss everything by hand until the cabbage pieces are well coated with the seasoning. Add the scallion, minari, and buchu. Add a little salt or more fish sauce to taste. Hi Hyosun, how long can this kimchi keep? It will keep for a couple of weeks. If you want to keep it longer, make it a little saltier. Hello! This recipe looks great, and I love your blog. I’ve found so many recipes here that I can’t wait to make! Hello Kathryn! Thank you for the love! Hope you enjoy many of my recipes. Grape syrup sounds really good! I am sure it will work beautifully with this recipe! Thank you so much for all your support and love for my blog! Hi, thanks for posting this recipe! I have been looking it for a long time after trying it at a restaurant few years ago. We also live near D.C. Do you buy the korean plum syrup? If so can you recommend a store such as one of the big chains in this area we can find it? Hi Kathryn – You should be able to find them at most Korean markets in the area, such as Lotte, Grand Mart, and H-Mart. Thanks! hello, i need to know if i can add toasted sesame seeds when serving only? i totally forgot abt it. And i did not take note that these should be made in small batches…i got too excited abt it HAHAHA! and i read i can keep it for weeks?? will it turn sour? i made it becos my family prefers kimchi tat is not sour.. Yes, that’s fine. Sorry for the late reply. I hope you enjoyed it. 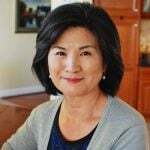 Hello, i love your recipes! 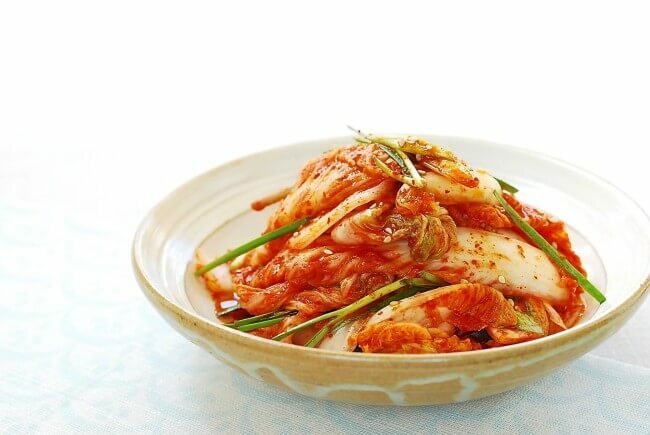 Can i mix this mak kimchi recipe with fresh oyster? There is my favorite korean restaurant that sells very nice galbi tang in california, and it was served with oyster kimchi (taste slightly sweet, not sour). I really like to know how to make it. Thanks. Yes you can. In fact, that’s what I do sometimes. Enjoy! 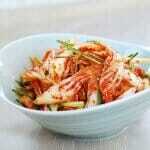 Hello Ms. Hyosun, I really love your fresh kimchi recipe. I’ve made this and yes, this is soooo good! So crunchy and fresh and a little bit hot. What I want to ask you is where and how can I keep the left gochugaru? I bought the pack for 500 gr/pack and I just use it for this recipe and now I got confused how to keep it. So happy to hear it turned out soooo good for you! I keep my gochugaru in the freezer. It will keep for a long time. Cheers! Thank you so much for this recipe. 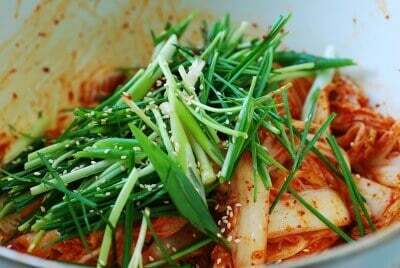 Do you have any suggestion for what to so with this kimchi after 2 weeks? 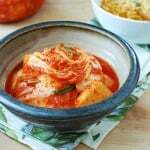 Can I make kimchi pancake of stew with this kimchi? Or fried rice? Awesome recipe. I cheat with a little MSG. Thank you. Is it possible to add some extra salt and let this particular recipe ferment on the counter for a day? Or should I just use a different recipe for that? Thanks! Love your recipes! I love fresh kimchi! Thank you for the recipe. Does this go bad after a long time? 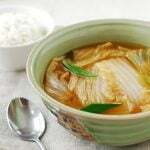 How long do u recommend eating it and what can you use the leftover fresh kimchi for? 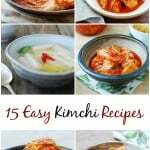 My 8 year old granddaughter loves this geotjori kimchi recipe! Thank you for posting this!